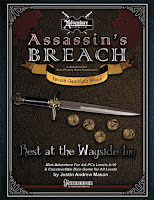 The new dice game I created, "Assassin’s Breach" and product-included adventure module, "Rest at the Wayside Inn" are now available for purchase. 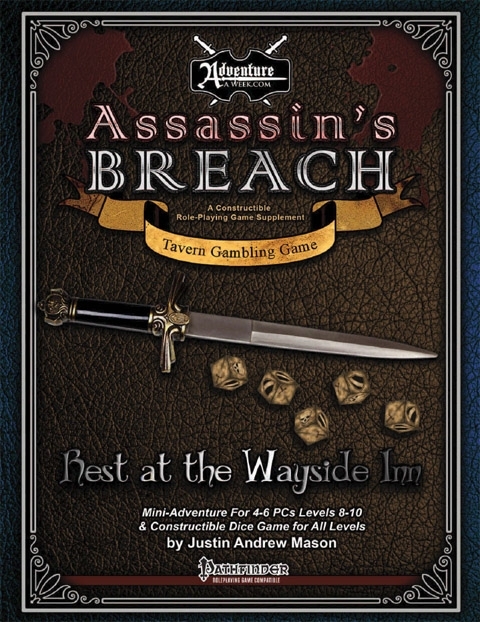 Assassin's Breach is a completely stand-alone gambling game that includes a set of constructible dice, tokens, and storage box. It is perfect for adding a fun element to the seedy tavern in any campaign. The rulebook also contains a complete Pathfinder RPG compatible mini-adventure designed for 4-6 PCs of levels 8-10 which utilizes the provided set of dice as an interactive prop. • A completely stand-alone constructible tavern gambling dice game including dice, tokens, storage box, and a rulebook. • A complete mini-adventure designed for 4-6 PCs of levels 8-10 which utilizes the provided dice as an interactive prop. • A new artifact-level magic item known as the bones of the weary traveler. • A new undead monster known as the Necrowight. • More than a dozen tavern denizen NPCs with backstories. • A detailed tavern map.